Before our Dinah Bug came along, we were hiking mad. We almost covered 100 miles the year before Bug was born. While Robin was pregnant, we covered some good miles up until the third trimester. 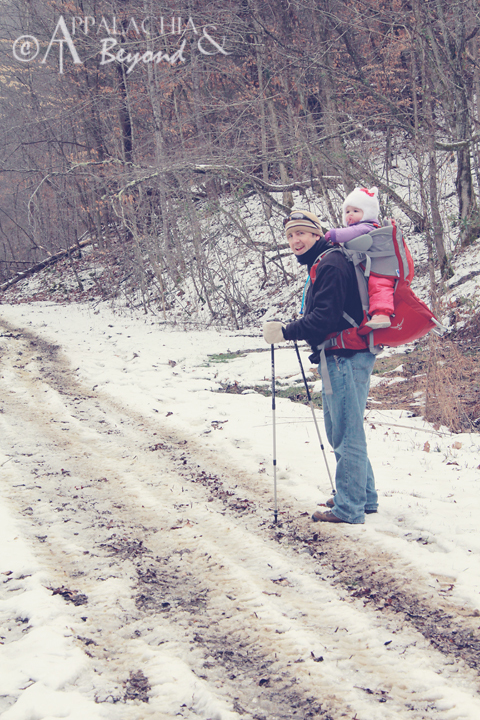 After she was born, our time on the trail was practically non-existent. How do you hike with an infant. Our answer was, you don't, especially in the winter. After the six month mark though we were getting the itch to get back on the trail. To be honest, we had the itch for much longer, but we didn't want anything happening to Bug and we didn't have a real good carrier to take her on the trail with. 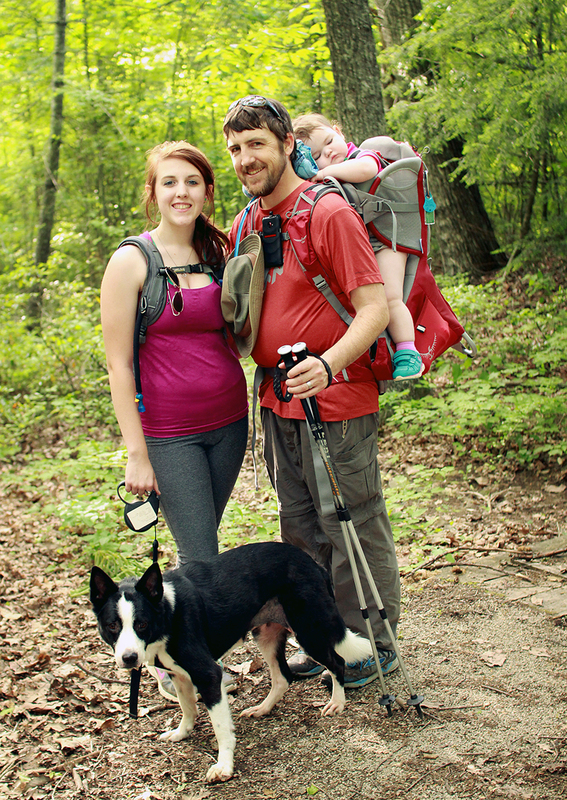 Enter the Osprey Poco Plus kid carrier pack. This was the answer we were looking for to get us back on the trails even though it we knew it would be at our former intensity. We knew 6+ miles were out of the question for now. Neither of us had ever hiked with a wee little one in tote. You may be asking, what about Kiddo? Well I didn't have her out on the trail until she was 3 and that was very shortly after I started to get into hiking, and before I met Robin, so needless to say I was very green, but I digress. We received the Osprey Poco Plus and it was like manna from heaven. We were dying to give it a test run. 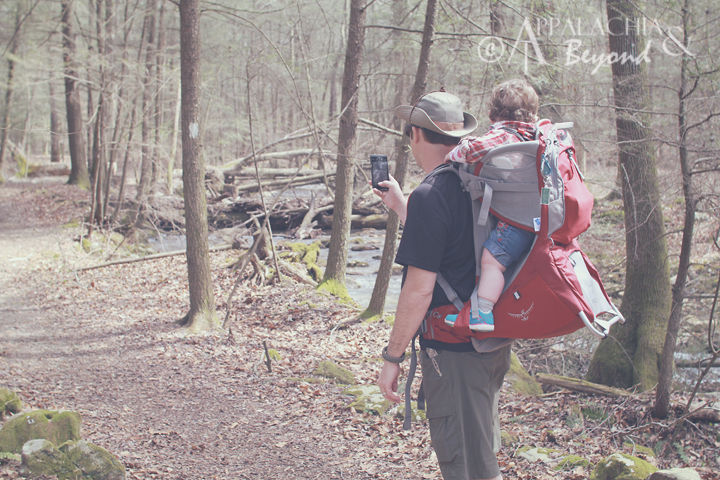 We took Boo out on one of her first hikes in it at Norris Dam State Park and did approximately 2 miles on the Marine Railway Loop trail. The Poco was wonderful. It has plenty of space to store Boo's essentials (Diapers, wipes, blanket to use to change her on, bottles, snacks, water cuppies, toys, etc.). It also has plenty of space to store other essentials for hiking in general as well as a change of clothes for Boo if needed and a jacket for the both of us. Another plus on the Poco is that it is hydration compatible, and Boo really loves having water at the ready for both her and myself. In addition, there are several pouches on the exterior of the pack that allow for water bottles, snack containers, or anything else you can think of for you and your little one. The seat is adjustable, up and down allowing for a proper riding position, and stir-ups are attached for your young'ins to slip their feet into if desired. The Osprey Poco Plus also comes with a sunscreen built into the pack that can be deployed quickly if needed. However, I have to say, I don't think our Bug prefers it being up, it limits what she can see even though the sides have a see through mesh. You can also buy and optional rain cover for the sunscreen as well. The kickstand for the carrier is very sturdy and we usually hike with it out all the time as the bottom compartment of the pack is attached to it. That compartment is usually pretty full. 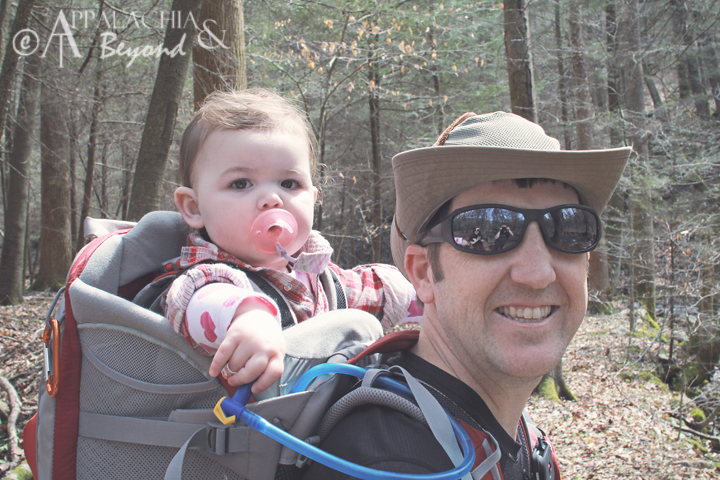 Total weight limit on the pack is 50 lbs (includes gear and child). The torso length for the pack is easily adjustable between a range of 15.5 inches to 21.5 inches accommodating a wide range of users. 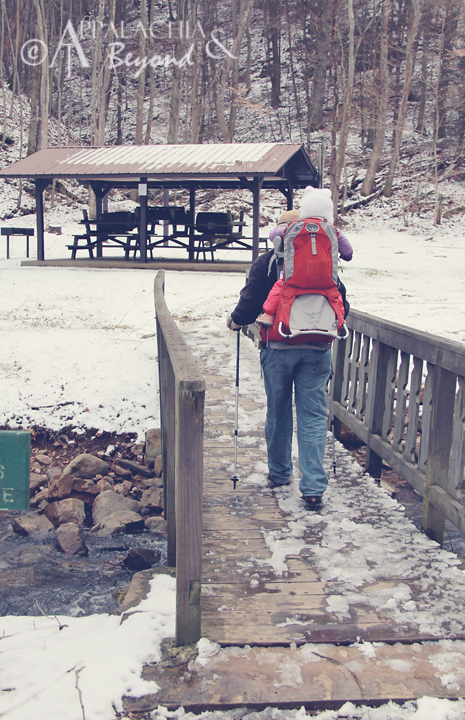 We've had Bug in the carrier on a few number of hikes as well as just around the house and even out in Gatlinburg. She loves to ride in it, so long as we aren't standing still for too long. Some days she will see it laying out of the closet and go to it expecting one of us to put her in it so she can go for a ride. When we first got the pack, that was about all we could do with it was walk her around the house inside and out. There is good padding on the front of the riding area complete with a nice removable/washable drool catching piece of fabric complete with little drawings stitched in sure to keep your toddler's attention for all of about 5 minutes or less if you are lucky. The best feature of all is that it must ride pretty comfortably, as on our last hike, Bug actually fell asleep in it. She usually won't fall asleep if she's uncomfortable. Gear capacity (cu. in.) - 1,404 cu.in. Fits torso - 15.5in. - 21.5in. Fits waist/hips - 26in. - 48in. Cell phone pouch on shoulder strap (won't accommodate large smart phones). Small Whistle built into the the latch on the chest strap. 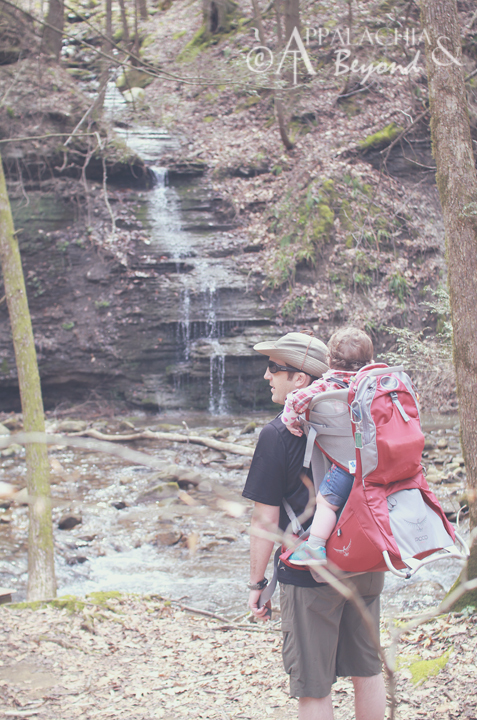 Overall, the Osprey Poco Plus is a great kid carrier and we highly recommend it to new parents who love and want to get their kids into the outdoors. If you want, you can splurge a little more and get the Poco Premium which comes with a detachable day pack (Day pack can be purchased separately for the Plus. )The Rain Fly is also included with the Premium. Disclaimer: Tim and Robin received the Osprey Poco Plus Kid Carrier Backpack for review purposes only. Appalachia & Beyond is in no way being compensated by Osprey Packs for this review. The opinions expressed above are Tim and Robin's independent thoughts and experiences.